SYRACUSE, NY - With the start of the 2019 season less than a week away, the Syracuse Mets are excited to announce their roster for Opening Day. 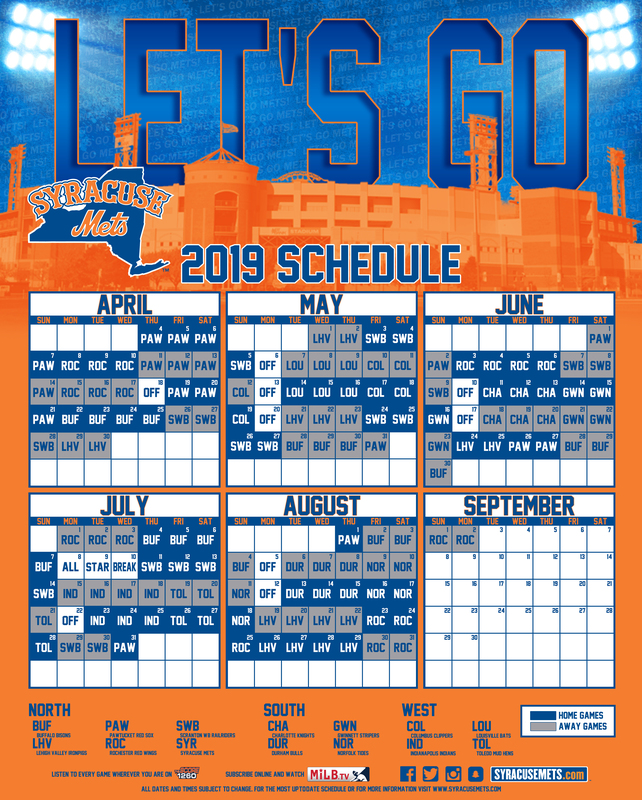 The Mets begin their inaugural season at home on Thursday, April 4th against the Pawtucket Red Sox at NBT Bank Stadium with first pitch scheduled for 2:05 p.m.
Tim Tebow comes to Syracuse as one of the most highly-anticipated names on the Syracuse Mets' Opening Day roster. The outfielder is in his third season in the Mets' organization and his first with Syracuse. The 31-year-old was named an Eastern League Mid-Season All-Star last season with Double-A Binghamton. Tebow's 2018 season was cut short because of an injury, but he hit .273 in 84 games last year with six home runs. The former NFL quarterback and Heisman Trophy winner is a two-time College Football National Champion with the Florida Gators and is a college football analyst on ESPN. Led by manager Tony DeFrancesco, who has 24 years of managerial experience, including 15 seasons at the Triple-A level, the Syracuse Mets will have one of the most experienced teams in all of baseball. Of the 25 players on Syracuse's Opening Day roster, 21 of them have played in the majors, combining for a total of 7,006 regular-season Major League games played in. In the outfield, Syracuse has two-time All-Star Carlos Gómez, World Series runner-up Rajai Davis , and two-time World Series Champion Grégor Blanco. Gómez (1,427 games), Davis (1,419), and Blanco (1,060) have played more Major League games than anyone else on the roster. Rymer Liriano (59 games) and Tebow round out the Mets' outfielders. Four of the five Mets infielders on the Opening Day roster have MLB experience, led by Danny Espinosa (872 games), who played with Syracuse in 2010 and 2013 as a member of the Washington Nationals' organization. Adeiny Hechavarría (811), Dilson Herrera (102), and Travis Taijeron (26) are the other infielders with experience in the majors, while David Thompson is in his fifth professional season and his second at the Triple-A level. Behind the plate, catcher René Rivera (506 games) brings a wealth of experience. Rivera has played with eight MLB teams over parts of ten seasons, including with the New York Mets in 2016 and 2017. Colton Plaia joins Rivera as a Syracuse catcher. The 28-year-old was drafted by the Mets in 2013 and has moved up New York's minor-league system, now entering his second season in Triple-A. The Mets' pitching staff features eight players on New York's 40-man roster and 12 players with experience pitching in the majors. 2015 American League All-Star Héctor Santiago leads the way with 238 regular-season MLB appearances and 887 innings pitched. The eight 40-man pitchers are: Tyler Bashlor , Chris Flexon, Drew Gagnon , Eric Hanhold , Corey Oswalt , Jacob Rhame , Paul Sewald , and Daniel Zamora . All eight pitchers on the New York Mets' 40-man roster have also thrown in the majors. The other four pitchers for Syracuse with MLB appearances are Arquimedes Caminero , Casey Coleman , Ryan O'Rourke , and Santiago. Corey Taylor has not pitched in the majors, but the 26-year-old is in just his fifth professional season and his second year in Triple-A. In total, the 13-member pitching staff has 724 regular-season MLB appearances and has thrown 1,604 innings in the majors. 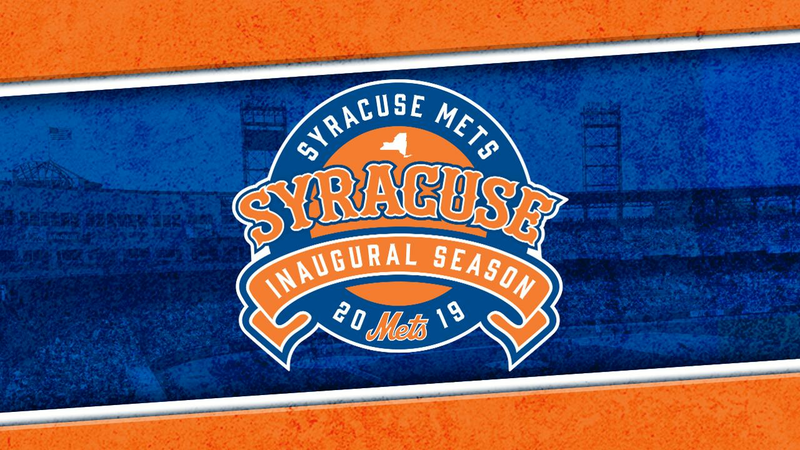 Tickets for 2019 Opening Day, as well as the other 69 home games at NBT Bank Stadium, are available for purchase at the Onondaga Coach Ticket Office at NBT Bank Stadium, over the phone during regular office hours (Monday-Friday, 9 a.m. to 5 p.m.), or online anytime at syracusemets.com.